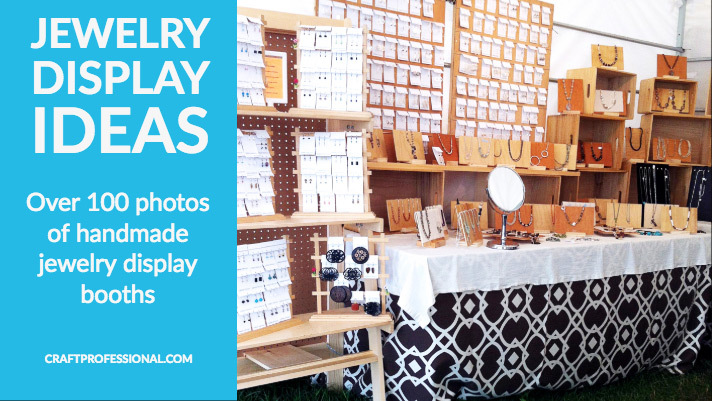 Whether you're designing a brand new display booth or you're looking to make improvements on an existing craft show display, I have lots of photos, resources, and tips to help. I've been collecting photos of wonderful display ideas since about 2012, and I've complied a huge collection that's still growing! I hope my photos will help you create your own fantastic display that attracts customers, shows your work at its best and fits within your budget. Creating your craft booth can be costly if you're not careful. Between tables, grid walls, lighting, risers, flooring, and table coverings, it all adds up pretty quickly. Ideally, you should try to avoid as much trial and error as possible and get your booth right the first time to avoid wasting money on a design that doesn't work. That just means you need to do some good research and planning before you start buying pieces for your display booth. The tips and photos below can help you do that! There's a massive amount of information about designing a craft display booth here. You can access more than 1000 of my original craft booth photos from this page. 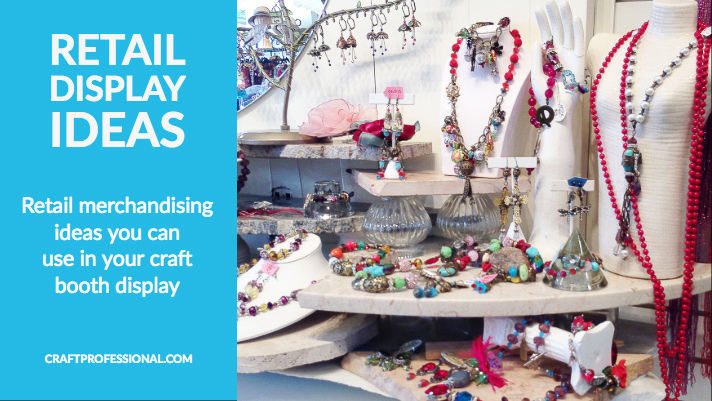 You'll also find links to several articles about creating a great craft booth. If you're in a hurry and don't have time to read the whole page, just click one of the links below to jump down to a specific topic that interests you. The best way to really understand what works and what doesn't in a display booth is to look at as many booths as possible. When you check out examples, you'll see what effect different display choices will have on your own booth. The point of studying the photos is not to copy someone else's fantastic booth, but to study it, find inspiration, understand what works, make good decisions about your own booth, and avoid costly mistakes. I've organized the photos in three categories to make it easier for you to find what you need. 1. Parts of a Craft Booth: If you want to learn about a specific type of display furniture - gridwalls, flooring, lighting, pedestals, tables, etc. - click on the link above to jump to this section. 2. Type of Craft: Here's where you'll find pages of displays grouped by type of craft. If you specifically want jewelry booth photos, soap displays, clothing displays, accessory booths, etc., start with the link above. 3. Craft Display Best Practices: This section features collections of booth photos that demonstrate important concepts in merchandising and booth design. You'll find booths that make spectacular use of color, booths that effectively put products in the spotlight, and booths that break the rules. The link above will take you to this section. All of these display booth photos are sorted based on the type of display furniture featured. If you want to see plenty of booths using grid walls, pedestals, tables, or shelves, you'll find them here. If you're looking for lighting ideas, portable flooring, and craft tents, you're in the right place. 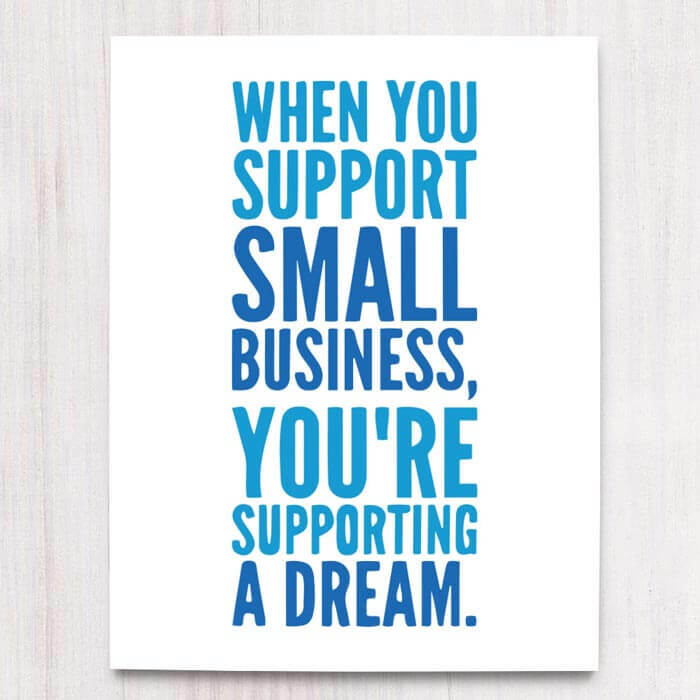 I've designed several signs you can print and display in your booth to encourage shoppers to splurge a little, support small business, and shop handmade. You'll find them all in my Etsy shop. 10 Craft Booth Sign Ideas: 10 ways to use signs in your craft booth to grab attention, communicate, and draw customers in. Portable Flooring Ideas and Booth Photos: Portable flooring that's attractive, affordable, easy to transport, and fits with the look of your product can form a solid foundation in your booth design. Here are several flooring options to consider for your display booth. Show Lights: Show lights are, unfortunately, often overlooked by beginning crafters. They can make a big impact. Here are 13 things you need to know before you buy lights for your craft booth. Booth Lighting Ideas and Sources: 8 craft booth photos with effective lighting solutions, plus, sources for buying lights for your own booth. Jewelry Display Lighting: Here are 8 photos of jewelry booths using effective portable lighting. Don't skip this page just because you're not a jewelry designer. Whether you're lighting up a jewelry booth, or any other type of craft booth, you can get plenty of inspiration from these fantastic displays. Portable Canopies: Do you need to buy a craft tent? Here's detailed information about the most popular craft tent brands, where to buy them, what features to look for, and how to choose a portable canopy that meets your needs. Tent Weights: It's not wise to do an outdoor show without weighting down your tent. Here are tips on choosing the right tent weights for your needs and instructions for making your own inexpensive tent weights. Gridwall Display Ideas: Here are 13 photos of craft artists' booths that use gridwall panels to display a wide range of handmade products. Slat Wall Displays: Are you thinking about incorporating some slat walls into your booth? Here are 7 booths that use slat wall panels. 14 Creative Uses of Shelves in a Display Booth: Do you want to use shelves in your booth? Check out these photos of craft booths that use shelves in a variety of ways for plenty of inspiration. Display Pedestal Photos: 6 craft booths that use pedestals to display everything from huge sculptures to small necklaces, plus information about where to buy pedestals for your booth. What to Look for in a Folding Table: Before you purchase a folding table for your craft room or your display booth, consider these 6 factors to ensure it meets your needs. Portable Table Using Ikea Legs: Another alternative for making an adjustable height, portable table. This one uses inexpensive legs from Ikea. When I went looking for portable craft tables for my booth, I couldn't find exactly what I wanted anywhere. I wanted a table that was a non-standard height and width, so I ended up making my own to get exactly what I wanted. It was a surprisingly easy project, and I have no carpentry skills, so that's saying something! If you you've checked out commercially available folding craft tables, and you can't find the exact size you want, DIY foldable tables are a great option. My Display Risers: Here's how I designed my custom display risers. Yes, they just look like simple boxes, but the dimensions were carefully planned so they work perfectly as risers when I'm at a show, and as storage when I'm not at a show. All of the photos in the posts in this section are organized by craft type. Are you looking specifically for jewelry booth photos, or pictures of handmade soap displays? Start here. 7 Jewelry Display Photos: Seven gorgeous jewelry displays featuring DIY and commercially made jewelry stands. DIY Portable Jewelry Display Ideas: Simple and affordable jewelry displays you can make yourself. Tabletop Jewelry Booths: 7 photos of tabletop jewelry booths to inspire your own craft booth design. Jewelry Booth Display Ideas: Get ideas for your jewelry display with this booth that's pretty, practical, and versatile. How to Display Jewelry: 5 photos of 2 outdoor jewelry booths. 12 Portable Jewelry Display Booth Pics: Here are 12 photos of 4 gorgeous jewelry booths with some creative and clever display ideas. Jewelry Display Ideas: Displaying jewelry can be tricky because you'll probably have a lot of it, and it is not easily seen from a distance. 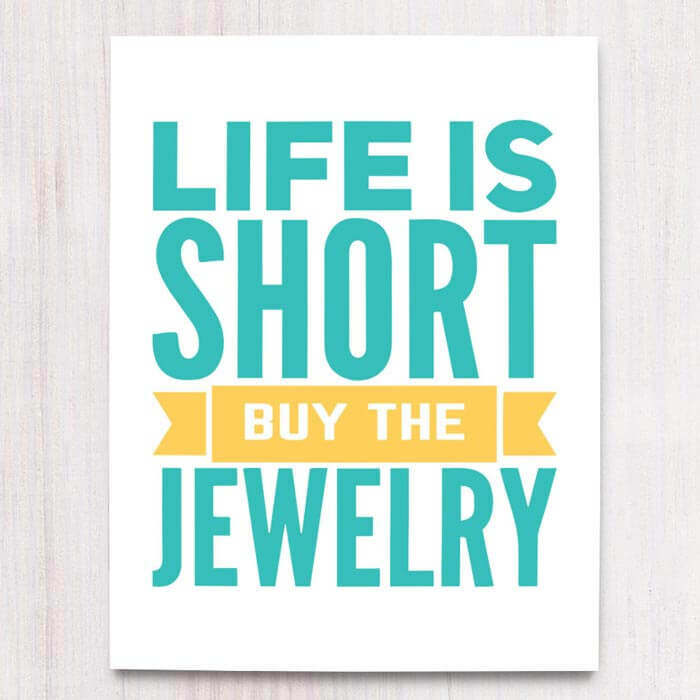 Luckily, there are lots of creative jewelry display options to choose from. Here are several photos of jewelry booths to give you ideas about how to display your own handmade jewelry. Jewelry Displays in All Black and All White: Some truly lovely and unique jewelry displays. Check out an all black jewelry booth and an all white display booth. See how a single, dramatic color can be used to effectively show off your handmade items. More Portable Jewelry Displays: Photos of eight great, but very different jewelry booths. 11 Displays for Your Jewelry Booth: 11 photos of effective jewelry booths help you see what works and give you inspiration for creating your own fabulous display booth. 6 DIY Necklace Display Stands for Your Jewelry Booth: 6 photos of clever necklace display stands you can make yourself for your jewelry booth. Jewelry Display Stand Tutorial: This tutorial shows you how to make a simple and inexpensive jewelry display stand from a few common, easy to find items (you might even have everything you need laying around the house already). 11 Necklace Display Ideas: 11 photos of necklace displays including commercially available busts and clever DIY display solutions. 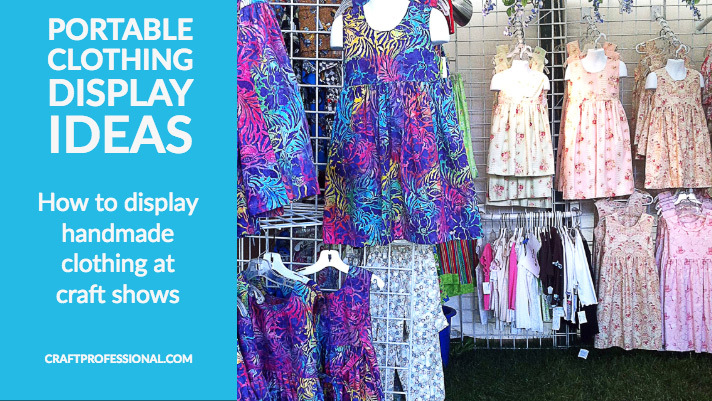 9 Clothing Display Booths: 9 fantastic clothing displays at a popular outdoor show. 6 Clothing Display Pictures: Learn how to set up the foundation of your clothing display with these 6 examples from an outdoor show. Portable Clothing Displays: 11 photos of clothing booths at craft shows, plus sources to recreate the look for your own display. 8 Children's Clothing Display Pictures: 8 photos of portable children's clothing displays that are affordable, practical, and gorgeous. 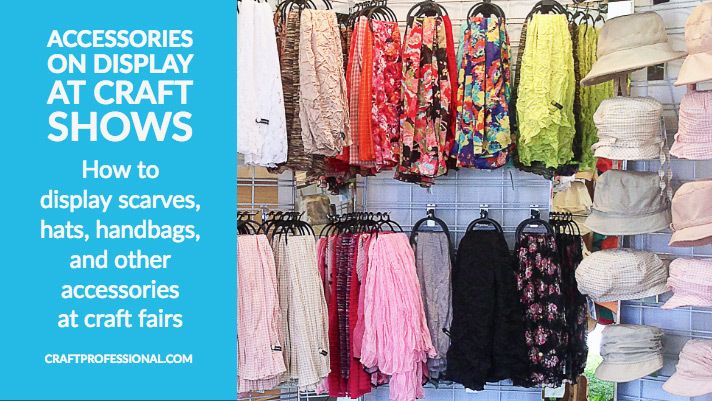 Plus: Where to find the items you need to display your own handmade clothing. 11 Clever Clothing Displays: 11 photos of clever clothing displays with plenty of take-away lessons you can apply to your own booth design. 10 Handmade Clothing Display Photos: 10 great photos show you the common elements often used in clothing displays, and illustrate how to use those elements to create your own distinctive display booth that showcases your company's unique style. 8 More Clothing Display Photos: Can't get enough clothing display photos? Here are eight more pictures of handmade clothing booths to help you create a vision for your own display! Handmade Clothing Displays: There are so many ways to display handmade clothing, and so many different moods you might want to convey depending on whether you create high-end avant garde designer clothing, or warm, snuggly children's sweaters. Take a look at the vastly different effects you can create in your clothing booth. Accessories Display Ideas: 8 photos of booths show you how to display scarves, hats, and other accessories. More Accessories Display Ideas: How to display purses and hats at a craft fair. You'll find 13 accessories booth photos, including hat booths, purse display ideas, and a few accessories that don't quite fit a category. 10 Hat Display Pictures: Looking for ideas to display your handmade hats? Here are ten photos of millinery booths showing how to display hats on everything from grid walls, to pegboard, to hat stands. 10 Photos of Portable Handbags Displays: 10 affordable, portable ways to display handbags at crafts shows. 9 More Handbag Display Ideas: 9 photos of fantastic handmade handbags and totes displayed on shelves, poles, grid walls, and more. Some lovely and clever booth setups here show you how to display purses at a craft show. 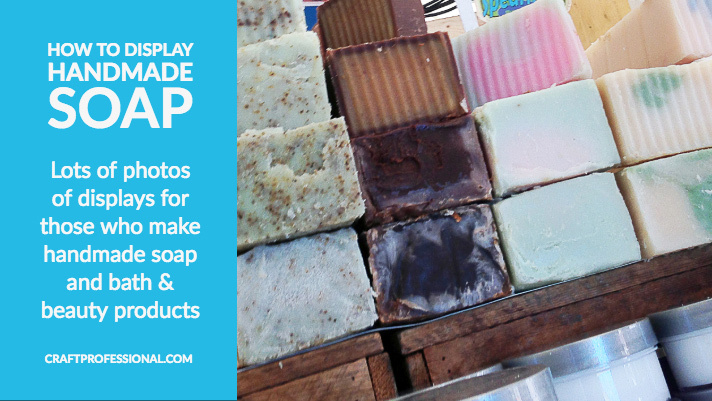 Soap Display Ideas: 6 soap display ideas to spark ideas for your own craft booth. Soap Display Photos: 5 soap display photos help to help you design your own soap booth for craft shows. 15 Photos of Soap Booths: Those who sell handmade soaps need to take into account a lot of the same factors as people who sell handmade candles when creating a booth. Many of the same considerations apply. Check out the pictures of these great soap booths, and also have a look at the candle booth photos in the link above this one; you might find a few ideas that translate well into your soap booth. 10 Soap Booth Photos: Can't get enough of a good handmade soap booth? I can never go to a craft show without stocking up on handmade soaps - always an affordable luxury. For you soap booth lovers, here are 10 more great booth photos. 6 Pottery Display Photos: Ideas for displaying your pottery and lighting up your craft booth. 10 Pottery and Glass Displays: 10 photos of glassware and pottery on display at indoor and outdoor craft shows. Pottery and Glassware Booths: Here are photos of six pottery and glassware booths that take great advantage of light to show their products and their best. The displays are sturdy but also allow customers to get up close to touch and examine each piece. Pottery on Display: Get inspiration for your own craft booth with these 6 photos of 3 pottery booths. 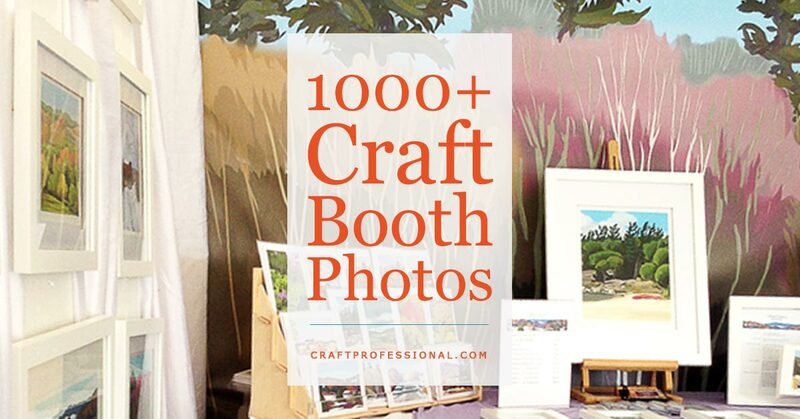 Art Booth Ideas: 8 photos show you how to display paintings and art prints at a craft show. 7 Art Booth Display Photos: Learn how to show your own original art, prints, or photographs at art shows with inspiration from these 7 portable art displays. Display Stands for Art Shows: 7 photos with ideas for using gridwalls, mesh panels, and other, creative stands to display your original art or prints at craft shows. Art Displays: Displaying paintings and other large art pieces is usually fairly easy compared to displaying smaller items, because your work can probably be seen from a distance and should be able to speak for itself without a lot of flashy extras. Still, there are a few decisions to make about how you're going to display your art. The page above includes many art booth photos as well as links to supply sources for items you may need for your art booth. 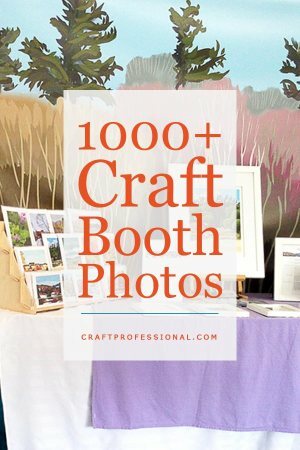 9 Food Booth Photos: 9 photos to help you plan your pop up food display booth for for craft shows. 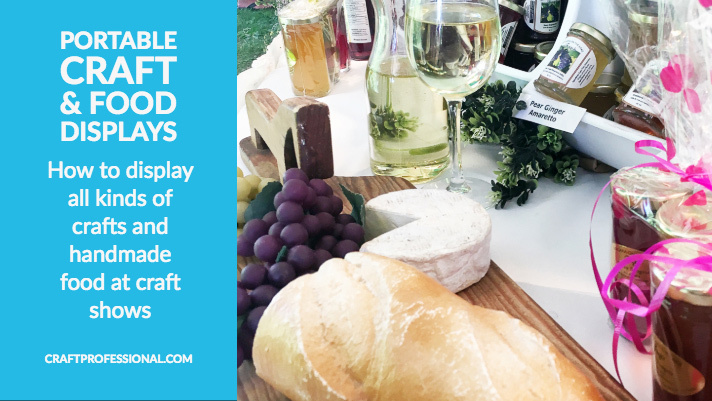 Food Display Ideas: 6 ideas for displaying food at craft shows. Sewing Booth Ideas: For all those who sew, here's how a reader displays her quilted wall hangings, handmade towels, and placemats. There are plenty of lessons to be learned from this fabulous display! Knitting and Crochet Booths: 9 photos of displays of knitwear and crocheted items ranging form knit sweaters, lovely crocheted blankets, hats, scarves and shawls. Candle Displays: When you display candles, you'll need to find a way to make a small product enticing from a distance, and also allow plenty of room and ease of access for customers to pick up, and smell (if they are scented) each one. Check out this page for photos and tips on creating a great candle booth! Craft Booth Ideas: 4 craft booth photos of products that don't fit typical categories. Other Types Craft Booths: Here's a collection of pictures for all kinds of craft booths that don't fit within the previous categories. You'll find woodworking, cards and prints, crocheting, and sewing booths. Beautiful Holiday Craft Show Booths: These beautiful holiday craft show booths will inspire you to spruce up your own display for Christmas craft shows whether you want to make big changes, or just add a few festive touches to your existing booth. 10 Christmas Craft Fair Displays: 10 photos of gorgeous Christmas craft booths show you how to spruce up your own display for holiday sales. Holiday Bazaars: Holiday shows provide a special opportunity to really spruce up your booth (sorry for the pun, I couldn't help myself). 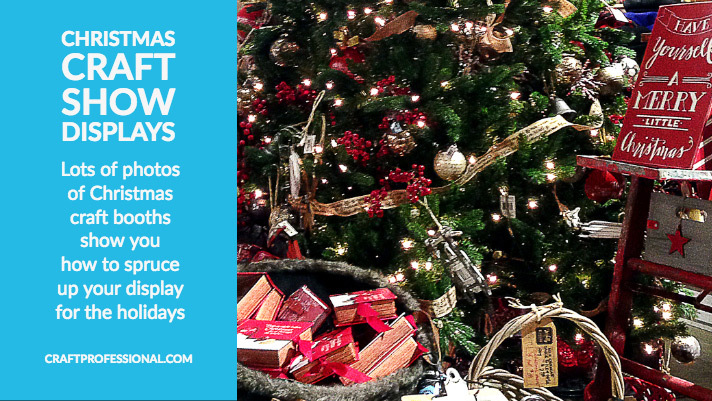 Here are lots of Christmas craft show booth photos and some ideas for boosting sales at holiday bazaars. Printables for Your Christmas Craft Fair Booth: Make your displays more festive for Christmas craft shows with these free printable Christmas decorations for your booth! Dazzling Handmade Jewelry Displays in an Indie Retail Shop: 7 photos of a spectacular indie handmade accessories shop using clever display pedestals and furniture. 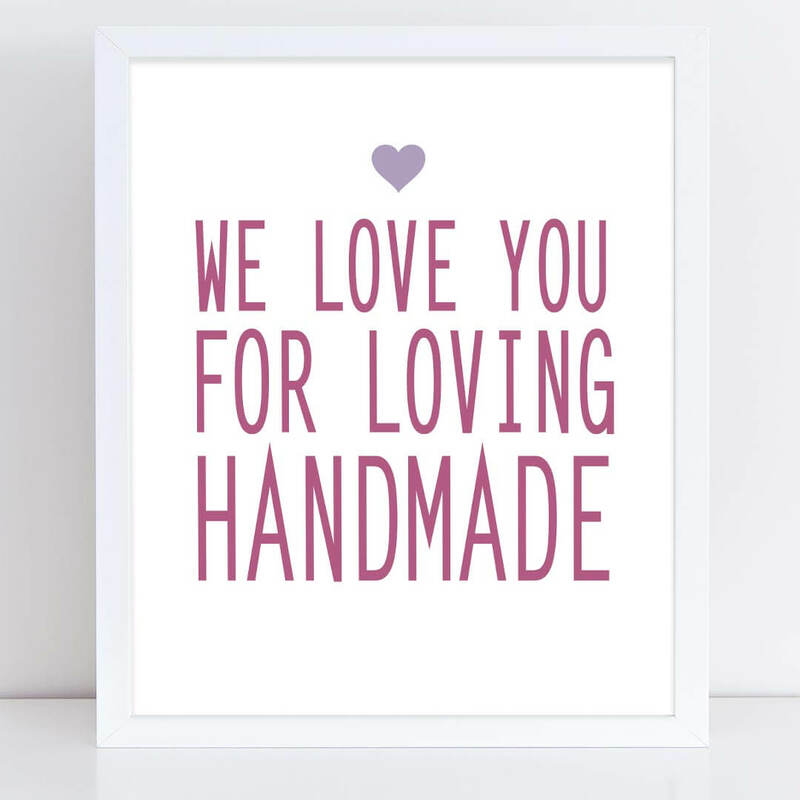 If you're planning a craft display, you need to check out this shop! It's simply lovely. 14 Retail Display Photos With Ideas You Can Translate to Your Craft Booth: Here are photos of 14 lovely independent retail shops that sell handmade goods. Their displays are fantastic, and you can translate a lot of them to your own display booth. Retail Display Ideas for Craft Professionals: See how the pewter artisans at Amos Pewter use color to make their stores memorable. 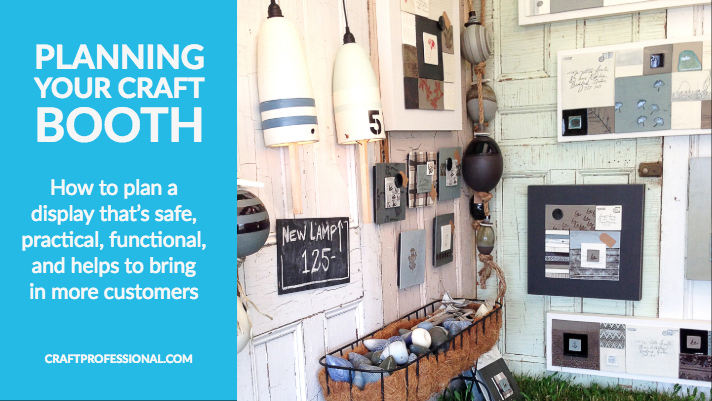 Retail Store Displays: 11 photos of handmade items displayed in retail stores, plus tips on finding booth ideas in the displays at your local retail stores. All of the links to booth photos below illustrate specific concepts related to craft booth design. Do you want to see how you can use color effectively in your displays? Are you wondering how to create a booth that doesn't "compete" with your products? These photos are the best place to start. Visual Merchandising Tips: 6 tested strategies used by big retailers to encourage customers to shop more. You can use all of these techniques in your craft booth to create a display that's more inviting to customers. 6 More Visual Merchandising Techniques: More wisdom from retail store owners. Here are 6 more merchandising techniques you can use in your craft display booth. Visual Merchandising Strategies for Your Craft Booth: How to use strategic display design, color, and smart signs in your display to sell more of your most profitable products. 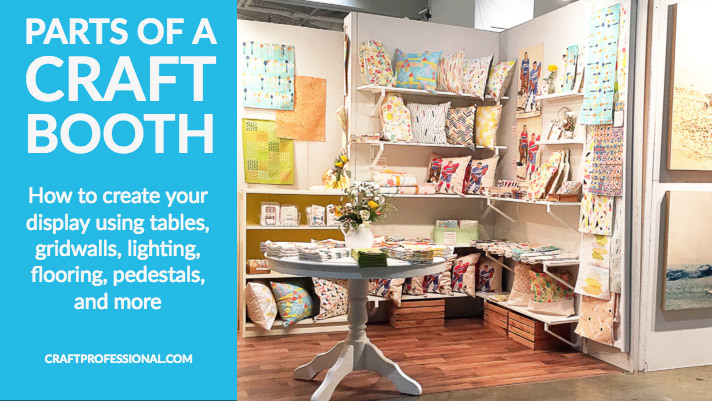 Visual Merchandising Display Strategies for Your Craft Booth: How eye level product placement, pyramid-shaped displays, and repetition and alternation can help you sell more at craft shows. How to Break the Rules in Your Booth Design: Want to defy common craft booth design rules? Go for it! But keep these tips in mind. Tell a Story With Your Craft Booth: 4 craft booths that entice customers by telling a story about how their lives will be enriched if they buy the product. 5 Simple Booths That Put the Spotlight on the Product: Embrace simplicity in your display and let your products take center stage. These 5 booths show you how. Beautiful Craft Booth Color: 6 booths that make clever use of color. Find out how a splash of color can liven up your own display. Match Your Display with Your Product: A good display booth works in harmony with the products you sell. It enhances them, and doesn't fight against the image you are trying to create. Here are photos of 16 booth designs that work with the product to create a cohesive look and communicate a clear message to customers. Display Your Items as They Would be Used: When you set up little vignettes in your booth that show your items displayed as they would be used, you can communicate a lot to customers about how your products function and how owning your products will enhance their lives. Here are photos of 7 booths that show you examples of how to display your crafts the way they would be used. Use Your Booth to Create a Mood: Whatever your style may be, your decor should fit well with your products and not compete with them or confuse customers. Benefits of a Great Display: Not convinced the way you display your items can really make or break your sales at a show? Read this article to understand the real benefits of investing the time and money to create a great display booth that shows your work in the best possible light. Craft Show Checklist: Download and print this checklist of items to bring to a show so you don't forget anything at home! Printable Show Regulations Check List: Follow these 14 common show rules to create a display that will comply with the rules of most shows, and use the Art Show Regulations Checklist (downloadable from the page linked above) to keep yourself organized. Popular Booth Layouts: Check out these popular 10x10 booth layout ideas. Examine the pros and cons of each, and determine which is right for your needs. 10 Etsy Finds For Your Craft Booth: Create a charming ambiance in your craft booth with handmade display booth furniture. Here are 10 wonderful Etsy finds to get you started. Display Booth Ideas: Want to find more great booth photos online? Here are three more places to look for lots of craft booth ideas. Displays Analysed: I have analysed two photos of some great booths. These booth photos illustrate 13 key concepts in good booth design, which you can apply to designing your own booth. My Craft Booth: This link takes you to several articles about how I created my own booth including instructions for making your own folding table and tips for designing your own multi-purpose risers. Displays That Work: Discover how to create displays that really work. Creating a booth that's attractive is just one part of the equation. Your booth also needs to be highly functional. Indoor and Outdoor Booths: There are different factors to take into consideration depending on whether your booth will be indoors or outdoors. Discover how to create displays for both indoor and outdoor shows. Safety and Practicalities: It can be a lot of fun using your creative energy to design a stunning booth. However, don't forget, a great display is also practical and safe. These ten tips will help you to ensure that your booth is functional, practical and safe. Create a Display that Draw in Your Target Customer: 3 tips to help you make your booth compelling to customers by conveying a clear, purposeful message. More on Conveying a Marketing Message: Discover how to create displays that make your customers want to open their wallets. Merchandising: Nine merchandising tips to help you make the sale. Attracting More Customers: You can't sell anything until potential customers walk into your booth! Yes, I know I'm stating the obvious. But people often don't consider how their booth looks from a distance and how they will draw customers in. Here are some tips to design your booth to draw customers in. Transporting: Dragging your booth from your home, to the car, and then from the car to your allotted space (and then the same in reverse when it's time to go home) doesn't have to be a difficult chore if you plan well. Here are a few things to consider to ensure your booth is as portable as possible. Booth Set Up: At the beginning of a show, you may be a bit on edge and anxious to get set up. You really don't need a time consuming or difficult booth setup to start your day on the wrong foot. Here's how to think about and plan your booth to make setup quick and easy so you can put your focus on the most important place - your customers. Storage: Good booths allow for plenty of storage for personal items and additional stock. Learn how to create a booth with plenty of storage. Teardown: It's the end of a show. You're tired, and the last thing you need is a complicated booth teardown. Here's how to design your booth with teardown in mind to make your life easier at the end of each show.